The year is 2741 and a massive contingent of alien spacecraft is circling the Earth's orbit. After attempts to communicate with the aliens go nowhere, you assume the role of a spacecraft commander, commissioned to prevent the threat of total annihilation. Prepare for a highly intensive battle, commander! 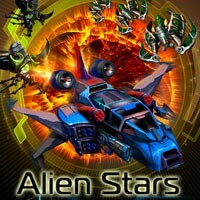 You will struggle through 12 diversely themed missions and respond to the challenge of thousands of alien spacecraft, equipped with the most advanced weapons. Can the humans win this time? query: INSERT INTO accesslog (title, path, url, hostname, uid, timestamp) values('Alien Stars', 'node/1308', '', '3.80.224.52', 0, 1556144245) in /home/surelion/public_html/drupal-4.6/includes/database.mysql.inc on line 66.